Marvel Studios ruled Hall H at San Diego Comic Con 2017. 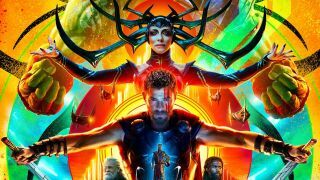 The 90-minute experience gave fans exactly what they wanted: Loads of never-before-seen footage, fresh concept artwork, new trailers... basically, it was a deluge of all things Marvel. Some wound up online, letting everyone and their mother freeze-frame footage to speculate over, but that's not all we learnt from the panel. The Marvel team let slip a ton of previously-unknown gems of info about the MCU and its upcoming movies so here's eight things you might have missed to get you fully caught up. The biggest casting reveal from the Marvel Studios SDCC panel was undoubtedly the news that Michelle Pfeiffer will be playing Janet Van Dyne in Ant-Man and the Wasp. The former catwoman will take on the role of Hope Van Dyne’s mother who was lost in the Quantum Realm years ago on a mission as the original Wasp superhero. How she’ll return and what her relationship will be like with her daughter and husband Hank, remains to be seen. Darren Cross’s company, from the original Ant-Man movie, is still up and running and potentially causing more trouble. Walton Goggins’s casting tells us that despite the demise of Yellowjacket in the finale of the original movie, his company is still going strong (or at the very least, existing) and given the technology, which must be archived within it’s walls, possibly up to no good. Wonder Woman must have set a precedent because now Marvel Studios has a prequel movie planned. Captain Marvel will be set pre-Iron Man in the ‘90s, according to an announcement during its SDCC panel and that throws up some interesting questions. Why has she never been mentioned in any of the other MCU movies then? Do the Avengers not know about her? Will she be rocking flannel and Doc Martens? One thing we do know for sure is that Nick Fury will appear WITH BOTH HIS EYES! Yes, lucky us. The Skrulls will be the primary antagonists in Captain Marvel. The classic baddies are an iconic extraterrestrial race with shape-shifting abilities, who tend to take humanoid form as they’re hellbent on taking over Earth. They first debuted in the Fantastic Four comics and went on to play an important role in the major Marvel comic event Secret Invasion. That event has been rumored to form part of the story for Avengers 4. So, could their presence here be sown deep into the MCU’s past to justify their appearance in the fourth Avengers pic? Unlike pretty much every other MCU movie (the ones that have been and gone, as well as the upcoming films), Captain Marvel will be the only one not directly connected to Avengers: Infinity War. This makes sense given that we now know it’s set in the ‘90s because otherwise Marvel Studios would have to do some serious retconning to squeeze the superhero into all its past stories. The question remains however, why will Captain Marvel not appear alongside any of the other superheroes? Fans have already started speculating that her solo movie will end with a Captain America-like sleep which will prevent her joining the Avengers… for now at least. It’s been a while since we’ve seen the Hulk. Like Thor, he was absent from the events of Captain America: Civil War and it turns out he’s been pretty busy - not wearing clothes and grunting. Mark Ruffalo said at the SDCC panel that after being in the guise of the green goliath for two years, Hulk doesn’t want to turn back into Banner. Why? Well he’s enjoying his life working for The Grandmaster as a gladiator on Sakaar. One of the stand-out moments from the new Thor: Ragnarok trailer was hearing the Hulk actually talk for the first time. Turns out he loves having the vocabulary of a two-year-old. After being teased on some early Funko toy box art, the big bad spotted at the end of the new Thor: Ragnarok trailer is now confirmed as Surtur. The fiery demon resides in Hell and is known as the king of the Fire Giants. In the box art, he’s seen wielding his trusty sword, which isn’t spotted in the trailer, but we’re holding out hope that it will make an appearance. Director Taika Waititi confirmed during the panel that he did the motion capture while Clancy Brown voices the flaming baddie.